Organizers picked inspirations from previous winning entries, and sent some on the road in an exhibit that includes Skin (above). 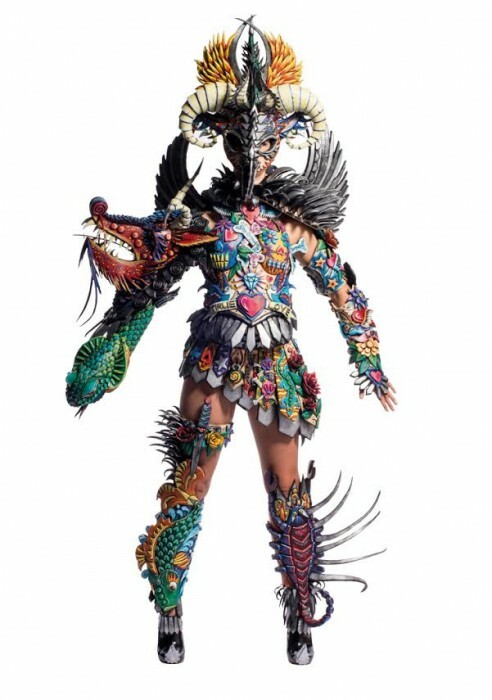 It’s from 2011, created by Quebec textile artist Marjolein Dallinga, who designs for Cirque du Soleil. Inkling, Gillian Saunders, New Zealand , 2013. EVA foam and paint. Other winners in the exhibit at Peabody Museum in Salem, MA (above & below). Sarah Peacock, New Zealand, Totally Sheepish, 2012. Wool and thread. Lynne Christiansen, USA, Gothic Habit, 2014. Felt, wood. Below, some of the winning designs at an event in Shanghai. WOW culminates in a live runway show for winners in front of an audience of 50,000. Below: inspiration for the Costume & Film (Science Fiction) Category. Main World of Wearable Art site, here. Some runway shots from the past, here. Wowzer! Wish we had a competition like this here in Toronto. Well, it’s off to the websites, I go! So beautifully out there, me too.